SunPower—which has been paying up to $2 million in tariffs per week—can breathe a sigh of relief. Exclusions are out, even as the industry moves on from tariffs. The U.S. Trade Representative on Tuesday filed a long-awaited document in the Federal Register detailing exclusions for Section 201 solar trade case tariffs. The exclusions, which are not retroactive, will be officially published on Wednesday. The exclusions encompass cells and modules with a variety of specific characteristics including back contact solar cells, frameless solar panels that are not blue or black, and off-grid 45-watt or less panels of a certain length. SunPower said its interdigitated back contact solar cells and modules are excluded. SunPower said the exclusion lets the company “turn the page” after the exclusions go into effect on September 19. According to the company, “for the past several months” it’s been paying $1.5 million to $2 million per week in tariffs while it waits for news on a possible exclusion. Jade Jones, a senior solar analyst at Wood Mackenzie Power & Renewables, said the administration's exclusions look tailored to SunPower. "It looks like it was written for SunPower," said Jones. "They are the only winner, and if you look at the list of companies that filed for an exclusion, it's not like they were the only one trying to seek exclusion." Jones added that one of the exclusions covers building-integrated PV akin to Tesla's solar roof, but the company is already planning to manufacture that product in the U.S. at its Buffalo, New York factory. SunPower stands out within the solar industry — which has collectively considered Section 201 more of a hiccup — as a company damaged by the administration’s policies. The latest Solar Market Insight report from Wood Mackenzie Power & Renewables shows the initial negative impacts from tariffs have stabilized somewhat. While the U.S. utility-scale pipeline grew to a record 8.5 gigawatts over the first half of 2018, SunPower in its Q2 2018 earnings report estimated a net loss between $195 million and $215 million in the coming quarter. In addition to its weekly cash hemorrhage, SunPower suggested it has made significant business decisions based on the tariffs. According to Natalie Wymer, SunPower’s vice president of global corporate communications, the company remained “optimistic” about its exclusion request up until the announcement “due to our reasons on why we should be excluded.” A company handout detailing why the company deserves an exclusion gives top billing to its investment in U.S. manufacturing. In April, SunPower announced it would acquire SolarWorld Americas, one of the petitioners in the Section 201 trade case. At the time, CEO Tom Werner said the move would “align” SunPower with the current administration. SunPower expects to close the deal in Q3 2018. Until Tuesday, it seemed the purchase had compelled little action from the trade representative. Throughout the winter and spring, SunPower sought and scheduled several meetings with trade staff, according to emails and meeting invitations obtained by Greentech Media. Though meetings between stakeholders and trade representatives are not themselves unusual — in the months following the tariff announcement, staff schedules show meetings with companies including Canada Solar, JinkoSolar and Majestic Steel — the timing of SunPower’s requests further suggest that the company pursued the acquisition as a result of the Trump administration’s policies. JinkoSolar, Hanwha Q Cells and LG Electronics have also invested in U.S. manufacturing since the tariff announcement. On April 6, a little over a week before SunPower would announce the acquisition, emails show Werner contacted Payne Griffin, the U.S. Trade Representative’s deputy chief of staff, requesting a meeting with Griffin and a colleague to discuss an “update on SunPower and U.S. manufacturing.” Documents show a meeting was scheduled for April 10. Wymer said the company did not tell USTR of its plans to acquire SolarWorld before publicly announcing the acquisition. Several days after the April 10 scheduled meeting, Werner again contacted USTR, this time for a meeting with Deputy Trade Representative Jeff Gerrish. Werner requested the meeting take place on April 18, the day the company ended up announcing its SolarWorld acquisition. Gerrish was unavailable. The meeting was scheduled for nearly a month later, on May 10. Ahead of its Tuesday announcement USTR had received nearly 50 requests for product exclusions from companies including SolarEdge, Sunpreme and Hanwha Q Cells. The administration has considered requests since March. "The key takeaway here is that exclusions announced today are only helpful to a limited number of suppliers, which means that the majority of U.S. solar demand over the next few years is still likely to require supply from imports subject to tariffs," said Cory Honeyman, director of solar research at WoodMac. 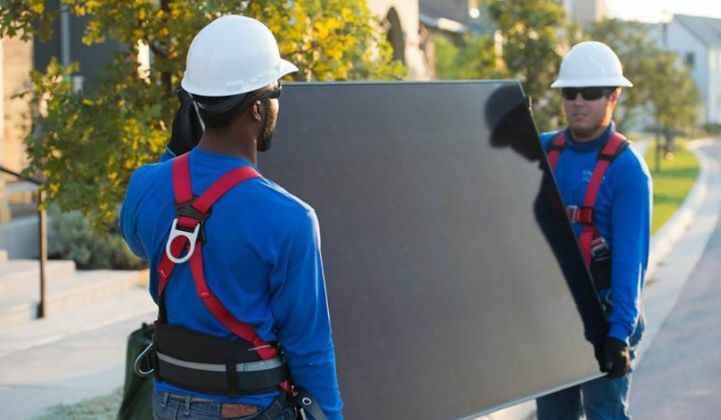 "On net, today's announcement is big news primarily for SunPower, but these exclusions are unlikely to be a game-changing factor for the majority of U.S. solar demand over the next few years." At the same time, the Trump administration has pursued further tariffs. Just yesterday the administration announced its final decision on duties that encompass inverters, a further blow to the solar industry that could impact balance-of-system costs.